This spring is on track to be the coldest for more than 50 years, provisional Met Office figures suggest. This month has seen lower than average temperatures and it has been wetter than usual, forecasters said. The UK's mean temperature for spring - based on figures from 1 March to 28 May - is currently 6C. If conditions stay the same in the last days of May, it will be the coldest spring since 1962, and the fifth coldest since records began in 1910. 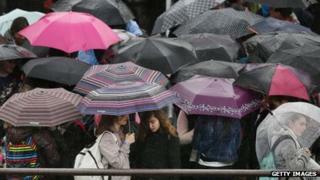 The Met Office said earlier figures from 1 March to 15 May suggested spring was on track to be the sixth coldest since records began, and the coldest since 1979. But cooler than average weather in the past fortnight has pushed the mean temperature for the season slightly lower, it said. The provisional temperature for this spring goes against recent form for the season, forecasters said, with eight of the past 10 years seeing warmer than average springs compared to the long-term (1981-2010) average of 7.7C. The main reason for the low temperatures in spring was a colder than usual March, which had a mean temperature of 2.2C to 3.3C below the long-term average. This made it the coldest March since 1962. The forecasters added that the colder than average conditions had been caused by frequent easterly and northerly winds, bringing cold air to the UK from polar and northern European regions. Earlier this month, snow hit Shropshire and Devon and Cornwall, while Wales saw widespread snow in March. Rainfall amounts for March and April were below average, but May is already wetter than average, with the average area receiving 86mm of rain up to the 28th day of the month - 70mm is the average. The Met Office said this suggested that spring overall would be slightly drier than average - but not as dry as the springs of 2010 and 2011. Cold spring: What does this mean for flowers?